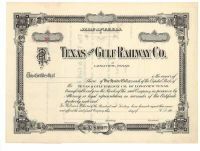 - TEXAS AND GULF RAILWAY CO.
Home » TEXAS AND GULF RAILWAY CO.
TEXAS AND GULF RAILWAY CO.
190-, Texas. Unissued stock certificate. Black / White. Ornate border.